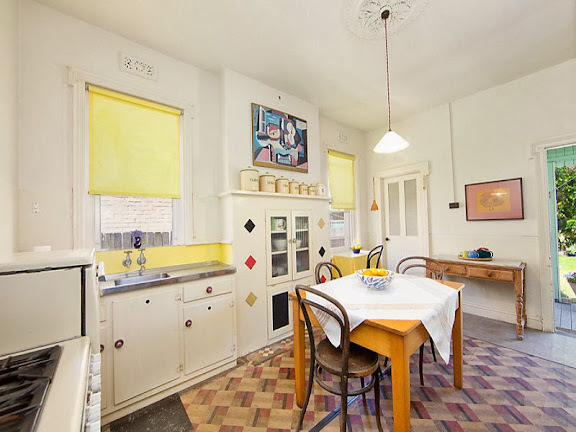 Recently two properties have been advertised for sale with either original interiors or faithfully restored interiors. Both are fascinating for the detail they display, the furniture used, and the colour schemes they use. 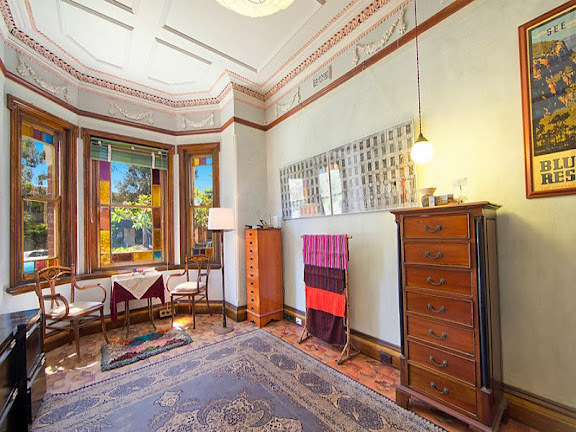 This house is Federation Queen Anne style, with Victorian features, such as the geometric designs in the stained glass windows, separate verandah roof and internal plasterwork. 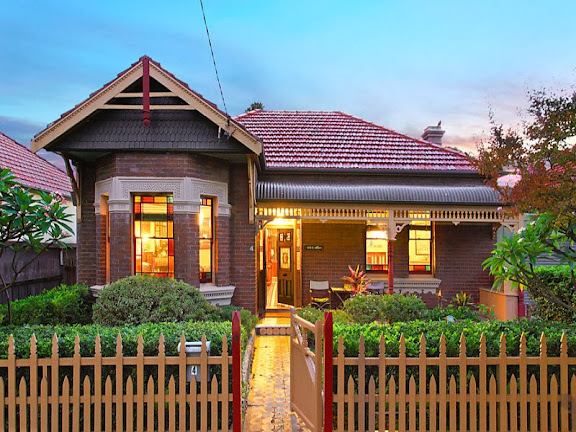 The old and the beautiful: Federation-era charmer 4 Rayner Street, Lilyfield. 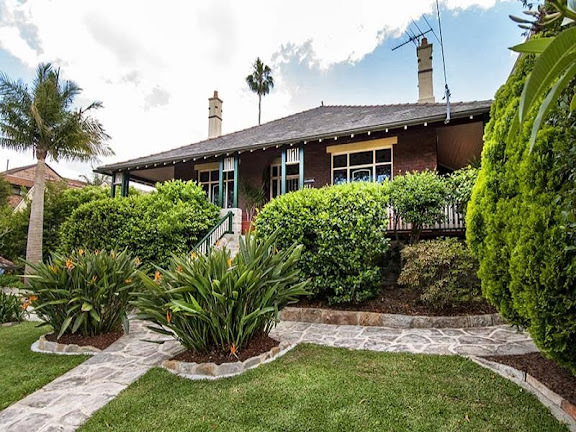 “The inner west is chock-a-block with old houses and the front facade of this Federation house in Lilyfield shows it to be another beautiful example. But what makes it extra special is the exquisite detail intact inside, and the 733 square metre block, more than double the suburb average. 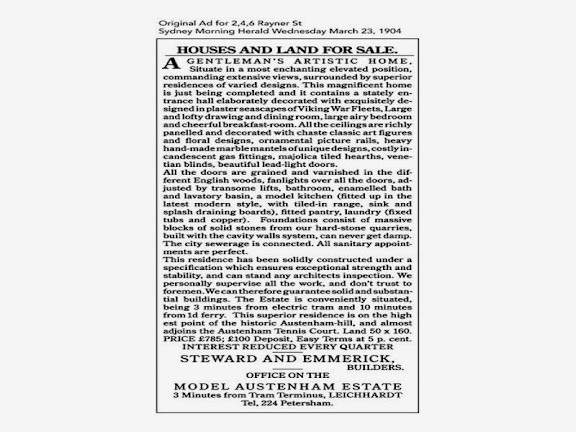 One of three ”gentleman’s residences” built by Steward & Emmerick between 1904 and 1906, the advertisement for it in The Sydney Morning Herald of 1904 contains an exhaustive list of features, such as ”chaste classic art figures” on the ceilings and ”costly incandescent gas fittings”, almost all of which are still there. Since the house is designed by builders, not architects, the styles are popular, rather than of the new period. 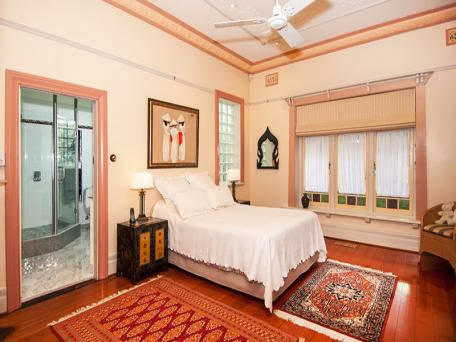 “A Federation-period residence, beautifully conserved and unique in both decoration and intactness. 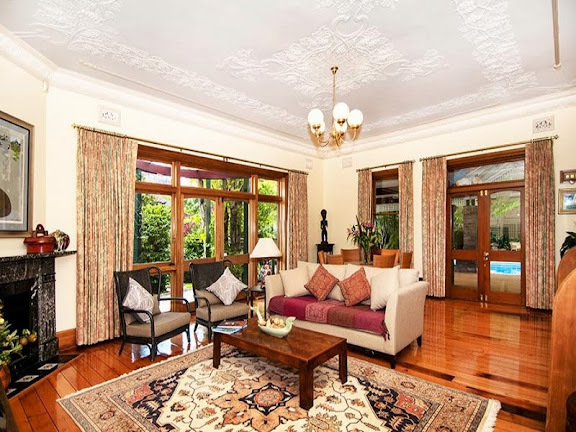 Built c1905 by Steward and Emmerick as one of three ‘Gentleman’s Houses’ and retaining almost all of the original appointments, Ruskinian is set on an expansive 733sqm approx. 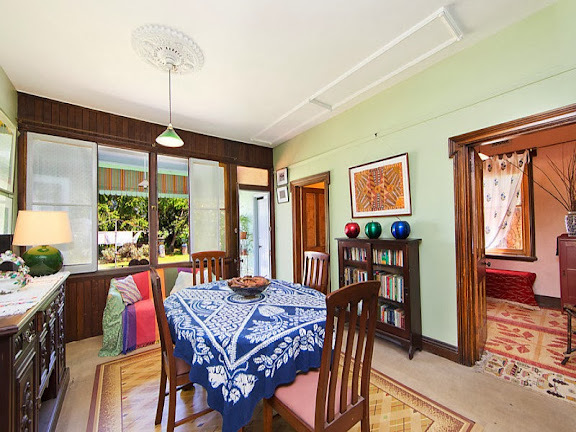 Timber picture rails are Federation period. The wreath decoration above the rails is a Victorian design. The patterned ceiling is Federation period. The marble fireplace, just visible, looks a Victorian ‘fussy’ design, as is the mirror. Furniture fabric is period, as is the plant and plant table. Federation style is a celebration of timber decoration, and here we see timber grain as a Federation feature. 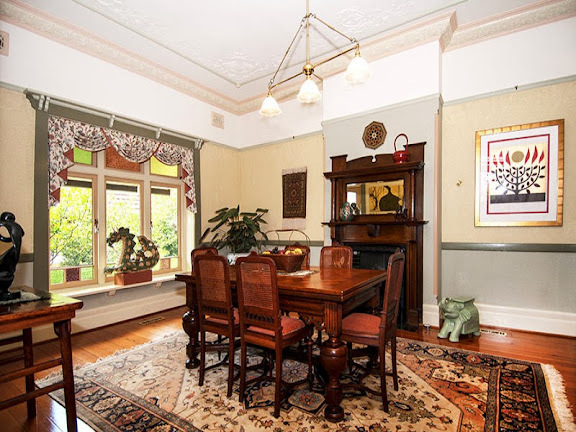 The furniture is mostly turn of the century, however the sideboard, not very visible, could be Victorian. The gothic coloured glass panels are typically Federation Queen Anne style, and so is the ceiling. However the wreath patterns are a hang-over from Victorian celebratory excess. 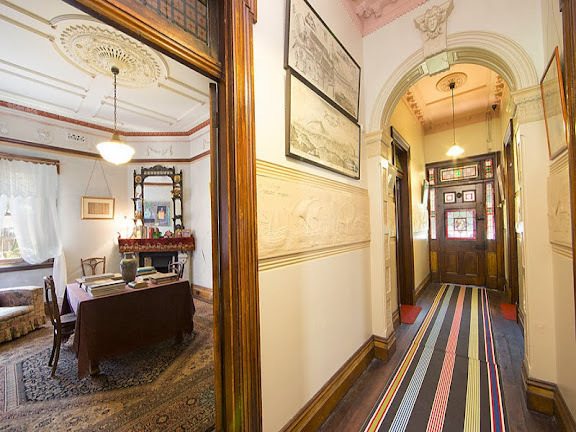 As noted above, since the glass is not Art Nouveau design, its design is typically Victorian, as are the hallway friezes and hallway arch. Notice the ventilation outlet, typical of gaslight installation. Clearly not an original Federation kitchen. Exposed rafter ends are a sure marker of Federation style, as are the chimneys. 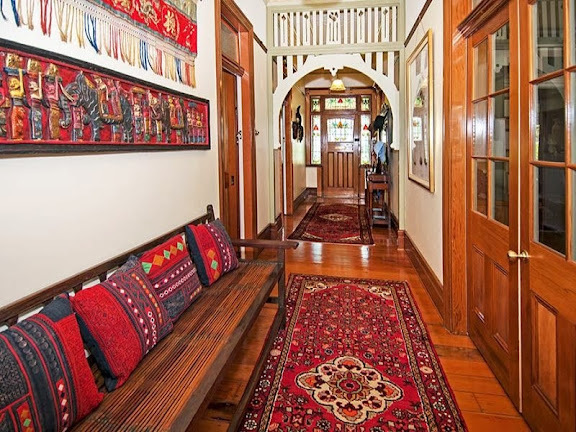 This hallway has a Federation style fretwork arch in timber, timber floors and timber woodwork throughout. 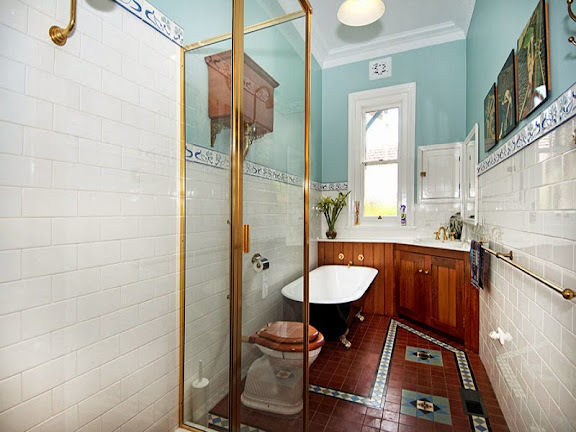 A beautiful ceiling, typical polished floorboards, no picture rails, and another marble (Victorian) fireplace. 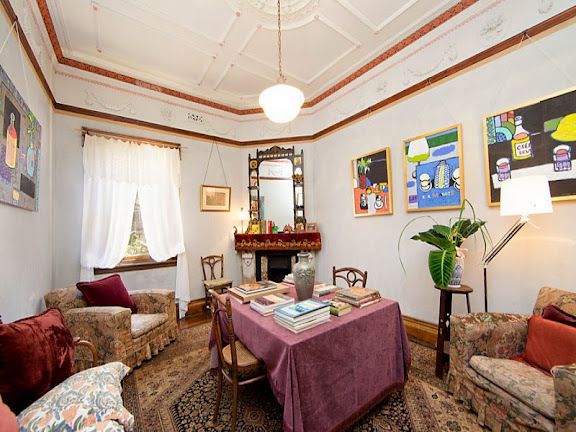 A bay window, ornate ceiling and cornices, picture rails, wooden fireplace are perfecty Federation style. Also the coloured glass panels. The dining furniture is however not of Federation style, since it is a complicated style of an earlier era. 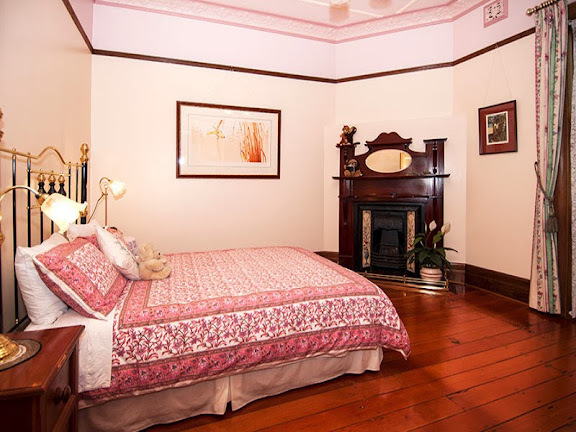 A very period bedroom, every part of which is in period, save the bed itself, since wooden beds are more typical of Federation period. 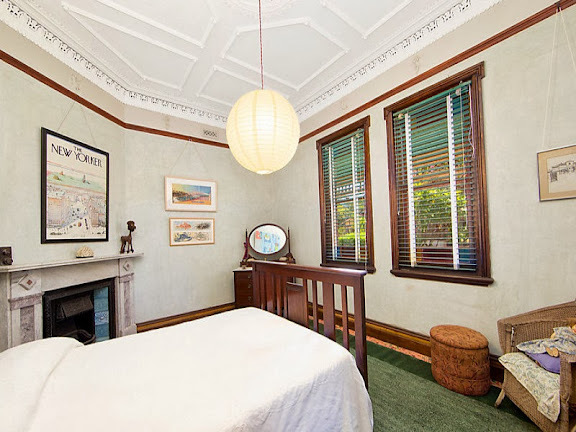 I love this bedroom, from the coloured glass gothic window lights to the elaborate cornice. Now this is a Federation bathroom. 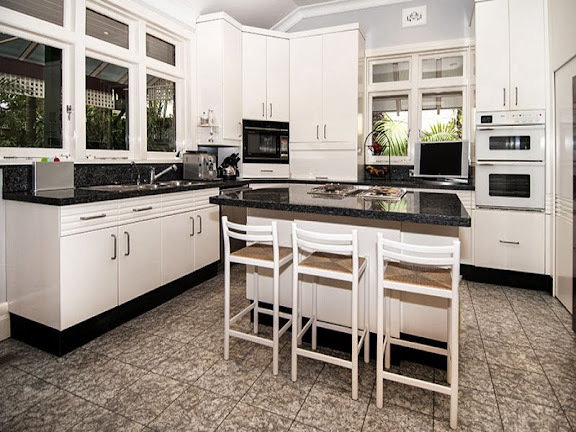 Who could blame an owner wanting a modern kitchen, but not out of character, and handsome as well.